George Alva Rushton was born on 31 July 1916 in Niagara Falls, Niagara County, New York. George Aldous Rushton and Mary E. Rhodes appeared in the US federal census of 1 January 1920 in Niagara Falls, Niagara County, New York, at 510 Fourth Street. Other members of the household included George Alva Rushton, Charles A. Rushton and Mildred M. Rushton. Son Edward, who would have been age 5, is not enumerated in the household. George Aldous Rushton and Mary E. Rhodes appeared in the US federal census of 1 April 1930 in Niagara Falls, Niagara County, New York, at 1613 Weston Avenue. Other members of the household included George Alva Rushton, Edward Millard Rushton, Charles A. Rushton and Mildred M. Rushton. The following appeared on 9 March 1932 in The Niagara Falls Gazette: George Rushton, as "Gringoire" in the play by that name, is cast as an ill-fated poet who loves his art better than his head. The productions. . . are being directed by Miss Elizabeth Flynn and Miss Evelyn Blackwell. 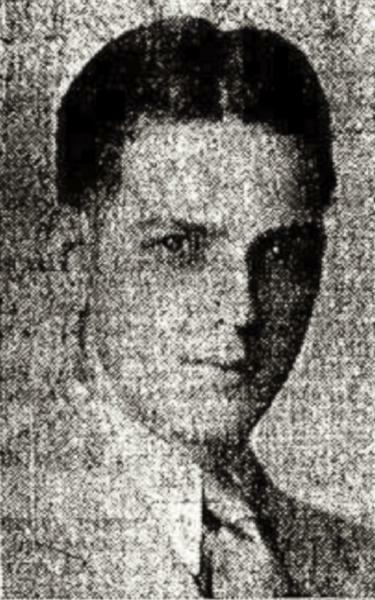 The following appeared on 16 October 1941 in The Niagara Falls Gazette: Lieutenant George Rushton, son of Mr. and Mrs. George A. Rushton, of 720 Monteagle street, left Tuesday morning for active duty with the Special Troops Headquarters company of the 44th Division now on maneuvers in North Carolina. Lieutenant Rushton is a graduate of the Niagara university R. O. T. C., where he was presented with the American Legion saber for excellence in drill and command. He is one of a long line of soldiers. His grandfather was a Spanish War veteran, his father and two uncles World War veterans. He married Jessie May Graves, daughter of William B. Graves and Frieda M. Coolidge, in September 1942. The following appeared on 26 September 1942 in The Niagara Falls Gazette: Mrs. Frieda M. Graves, 1428 Fort avenue, this city, announces the recent marriage of her daughter, Jessie May, to Lieutenant George A. Rushton, son of Mr. and Mrs. George A. Rushton, 720 Monteagle street, this city. The young couple, shown above, were married at Fort Lewis, Washington, where Lieutenant Rushton is currently stationed with the Adjutant General department of the 44th Infantry Division. Captain Howard Tomlinson, assistant division chaplain, officiated. Mrs. George Rushton and son, Jerry, mother and brother of Lieutenant Rushton, and Mrs. Birdella Bell, also of this city, who recently returned from an extended trip along the West Coast, were present at the ceremony.. The following appeared on 7 June 1948 in The Niagara Falls Gazette: [Born, at Memorial Hospital] To Mr. and Mrs. George A. Rushton, 723 Townsend place, June 6, a son. The following appeared on circa 25 August 1963 in The Niagara Falls Gazette: Mr. and Mrs. George A. Rushton, 720 Monteagle St., were feted Saturday night at a family reunion in the LaSalle Room at the Treadway Inn in celebration of their 50th wedding anniversary. They were married Aug. 25, 1913, in Niagara Falls. Hosts at the surprise affair were their four children, Mrs. Edward Harness, Ft. Ord, Calif; Gerald E. Rushton, Cuyahoga Falls, Ohio; George A. Rushton, Appleton, Wis., and Edward M. Rushton, 4239 Crescent Drive. A cross-country trip to the home of Mrs. Harness, with stops in Wisconsin and Ohio, was the gift of the children. Mrs. Harness was unable to be present at the celebration. The couple also was honored at a dinner at Hotel Niagara on Aug. 17 by the Past Matrons of Niagara Falls Chapter No. 582, Order of the Eastern Star, with Mrs. Cecil Marshall presiding. Presentations were made that time by Mrs. Milton Norris on behyalf of the Messiah Shrine No. 18, Order of the White Shrine of Jerusalem; Niagara Falls Court No. 30, Order of Amaranth; LaSalle Chapter No. 785, OES, of which Mr. Rushton is a member; Niagara River Triangle No. 120; District Deputy and Staff of Rebekah, Niagara No. 2 and members of the former drill team, LaSalle Chapter OES of which Mr. Rushton was drill master for several years. After the presentation Fred Moir sang a solo and a mock wedding was portrayed. A tiered wedding cake was prepared by Mrs. William Sharples and decorated by Mrs. William Garner. Attending the family party were brothers and sisters f the honored couple. They were Mrs. Mable Duffy, Buffalo; Mr. and Mrs. Andrew B. Rhodes and family, Sarasota, Fla; Mr. and Mrs. Charles A. Rhodes and family, Englewood Cliffs, N.J., and Mr. and Mrs. Charles H. Rushton and family, this city. The couple has nine grandchildren. George Alva Rushton became a widower at the 12 January 1996 death of his wife Jessie May Graves. George Alva Rushton died on 8 May 2001 at age 84 in Appleton, Outgamie County, Wisconsin, at The Heritage, 2600 South Heritage Woods Drive. He was interred at Appleton Highland Memorial Park, Appleton, Outgamie County, Wisconsin. The following appeared in a Wisconsin newspaper: George A Rushton (2600 Heritage Woods Drive, Appleton), age 84, passed away at the Heritage on May 8, 2001. Born in Niagara Falls, New York, on July 31, 1916, he attended local schools and Niagara University for his undergraduate and graduate studies. While attending college during the Depression, George worked evenings at Kimberly-Clark Corp.'s Niagara Falls Mill. He was listed in "Who's Who" in American Universities and Colleges and was named the outstanding military ROTC Honor Graduate. Upon graduation, he joined Kimberly-Clark's Niagara Falls Mill Personnel Department; and one year later was ordered to active duty with the 44th Infantry Division and later with the XVI Army Corp Headquarters as an Assistant Adjutant General. During World War II, he served in Camp Polk, Louisiana, Fort Dix, New Jersey, Forth Lewis, Washington, and Fort Riley, Kansas as well as serving in the European Theatre of Operations with distinction in England, France, Belgium, Holland, and Germany. He received five military medals and ribbons during the war years. Upon release from active duty, he rejoined Kimberly-Clark and in 1952 was transferred to KC's corporate headquarters in Neenah as Personnel Superintendent for Research and Development. George also served as Manager of Management Training and Development for the Lakeview Mill; retiring in 1981 after 44 years of service. Over the years, he remained active in the U.S. Army Reserve in New York and Wisconsin. While in Appleton, he served as a Lt. Colonel commanding the 5009th Research and Development Unit prior to retiring from military service in 1976. George was a member of KC's Quarter Century Club, 58-plus year member of the Niagara Frontier Masonic Lodge No. 132, a life member of the Reserve Officer's Association and the Retired Officer's Association. Over the years he held numerous positions of leadership in various civic and community organizations in both Niagara Falls and Appleton. He was a charter member of the 44th Infantry Division Association and a past distinguished president of Appleton's "Golden K" Kiwanis club. He was Chairman of the YMCA Physical Education Committee for many years working with Director Mickey McQuire and was also active in the Appleton Cub and Scouting movement. He was a lifelong member of the United Methodist Church serving as Youth Department Superintendent as well as on various committees, commissions and board of trustees. He was also a former usher and for many years a certified lay preacher for his church. In tennis, George still holds the distinction of being ranked No. 1 by Wisconsin Tennis Association for five consecutive years in the 45 years of age and over senior singles division. In addition, he received many honors over the years for his tennis accomplishments in local, state, Midwest and national tennis circles. He was particularly proud of the year 1965 when he won the Wisconsin State Title and his son Jeff won the State Junior Title. Other interests included golf, bowling, table tennis, racquetball, horseshoes, bridg, backgammon, and reading. He enjoyed devoting time as a volunteer to various community organizations. George was preceded in death by his beloved wife, Jessie May (Graves) on January 12, 1996; his parents, George and Mary (Rhodes) Rushton; a sister, Mildred; and three brothers: Edward, Charles, and Gerald. Survivors include a daughter, Sandra and son-in-law, Wendell Smith, Goodyear, Arizona, a grandson, Chad Smith, Las Vegas, Nevada, granddaughter, Tiffani (Paul) Hamstra, and great-grandsons Noah and Johah, Avondale, Arizona; a son, Jeffrey and daughter-in-law Christine, and grandchildren Hollie and Mathew, Mequon, Wisconsin; a sister-in-law, Mary Ann Rushton, Roland, Ohio; a brother-in-law and sister-in-law, Charles and Louise Graves, Greenbrook, New Jersey. Also surviving are several nieces, nephews and many dear friends. Devotion to family was always uppermost in the lives of both George and Jessie. There will be no visitation. Memorial Services will be at 11 a.m. on Monday, May 21, 2001, at First United Methodist Church, 325 East Franklin Street, Appleton, with the Reverend Kent Ingram officiating. The family will receive friends directly following the service in the Fellowship Parlor. Inurnment will be in Appleton Highland Memorial Park. A memorial fund has been established for the youth department at First United Methodist Church, Appleton and the local Salvation Army. Wichmann Funeral Home, 537 North Superior Street, Appleton.